Many people don’t realize the simplicity of all the measurements done specifically to correct myopia at the optometrist. At the optometrist shop there are many tools, everything is done quickly and usually without explanation of the very basic principles of how glasses prescriptions are determined for your eyes. If you knew how to do it yourself, they would be letting you onto the slippery slope of self discovery – and ultimately, to question the entire practice of using glasses to cover up the myopia symptom. Diopters Are Just Inverse Meters. 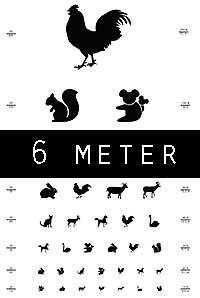 It means that you can very easily assess how much myopia you are dealing with. You don’t need to go to the optometrist to find out if you need glasses, or stronger glasses. You can accomplish the same thing, often more accurately, at home. And now, with the new tools available here, you can do it without ever having to leave the house or buy any equipment at all. Once you grasp the concept of diopters, you’ll be tempted to experiment. I encourage you to measure your eyesight in the morning, and after a long day of close-up work. Measure in good outdoor ambient lighting, and in an almost dark room. Compare your findings. Begin to realize that there is so much more to eyesight health than that optometrist visit would suggest. 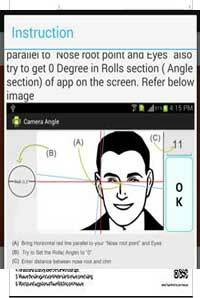 You Can Measure Your Eyesight More Accurately On Your Own. In the blog you find me occasional talking about common optometrist tools, like the autorefractor. We talk a whole lot about overprescription, and the fallacy of the establishment’s single prescription theorem. All this starts to make sense as you begin to take measurements, keep a bit of a log, and begin to the see the full picture that the optometrist has no interest in showing you. Of course this is a large topic – which we explore at length in my member only therapy access. Above, the 3 meter chart – meaning if you want to check your vision from a three meter distance, that’s the one you want to print. You can do it at home or at a local print shop, which can also laminate it for you (very nice for a durable chart!). 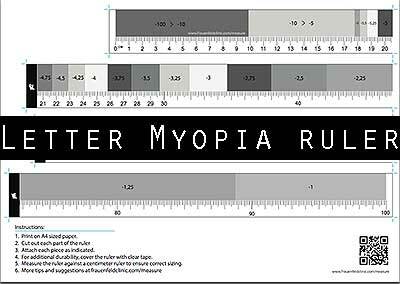 Remember when we talked about myopia being just inverse meters? Well, this chart helps make sense of that statement. All you need to do is find out how far you can move back from a printed page (or computer screen), before the text you see becomes blurred. And by blurred we mean when the slightest blur starts to manifest. If this is your first time measuring, give yourself some time. It’s a bit of a self discovery process, as you might never (in your whole life possibly and sadly) have tried to determine your own blur distance. This is about as basic of a concept as measuring your weight, but sadly hidden from public health education. The amount of centimeters that separate your eyes from the printed page just barely without blur, can be directly expressed in diopters. So you can use any kind of measuring tape to determine how strong your prescription glasses need to be. There is lots more on the subject here (and in the links on that page). Above of course is the A4 size. Since we are talking small increments here, the accuracy is important. 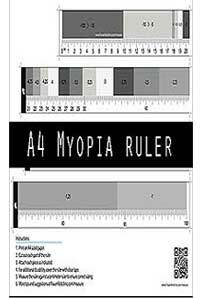 Choose this one if you in your country A4 is the standard paper size. After printing do check it against a regular measuring tool to ensure that you have it printed to correct scale! And the second choice, if you live in countries where the “letter” size is the standard paper size. For best results, do take the time to follow the links suggested in this article to fully understand not only how to measure but also how to interpret the results for yourself. For official requirements and medical use, please consult with your local medical professional. All materials herein are for educational purposes only. You know I had to say it.